On a recent visit to the far north of Scotland, I found myself crossing the Atlantic to the Orkneys. Having studied archaeology as a teenager, the islands have long held a fascination for me. This odd outpost of the British Isles is full of pre-historic monuments, better preserved than many on the more populous and busy mainland. 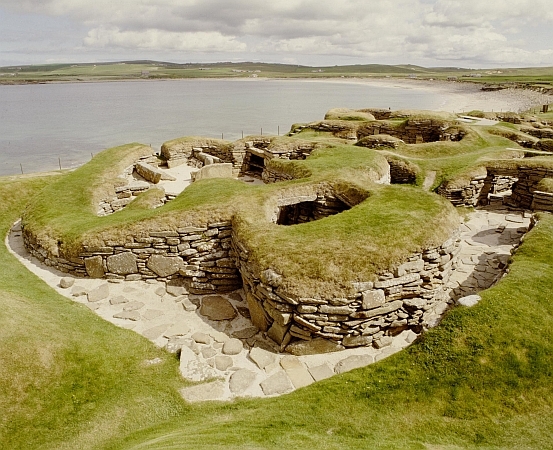 Skara Brae is unique; a paleolithic habitation that survived untouched for centuries as it was buried under the sand dunes, revealed finally by a storm in the 19th century. On the day of my visit, warm sunshine met a strong wind, and the coachloads of American tourists wandered around the site trying to appear impressed. It’s a quiet affair atmospherically, but the soundscape was extraordinary. As we tried to connect with the everyday lives of those generations of early farmer/hunters, the modern farm close by provided a background of distressed cattle. The wind ripped through my wind shield, building an almost tangible wall of bass, in and out of which the inhalation of the sea shuffled and drifted.